Bela Lugosi had little to show for his first year in Hollywood. His film roles were few and minor. Lugosi was not alone. Silent films were all but dead, and uncertainty reigned over the film colony as it converted to sound. Some foreign actors with accents less impenetrable than Lugosi’s left Hollywood forever. When Lugosi spoke to reporters he still harped on the evils of typecasting, and added talkie pictures to his dislikes. To make ends meet, Lugosi again signed for a road tour of Dracula. He played the run through Los Angeles, Santa Barbara and Bakersfield, but left when he at last landed a solid movie role, as Inspector Delzante in Tod Browning’s The Thirteenth Chair. He rejoined Dracula for San Francisco and Oakland performances. 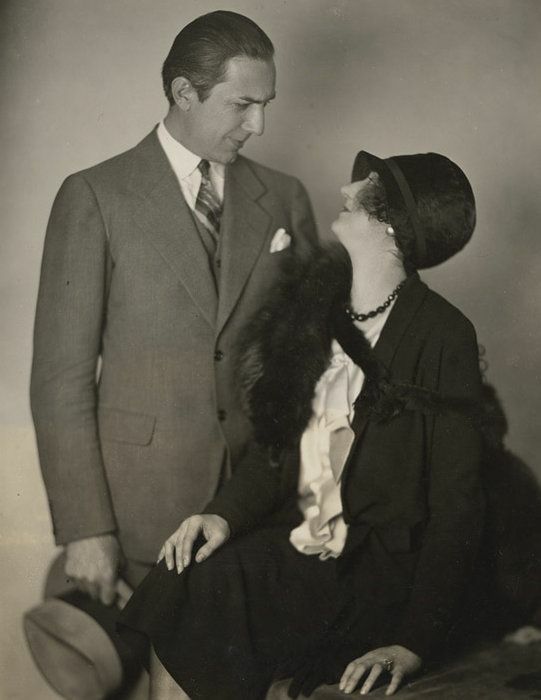 Of more interest to San Francisco journalists than his acting was Lugosi’s marriage to rich widow Beatrice Weeks. He parries well with reporters on that topic, and gives no hint of the domestic discord that ended the marriage in just a few days. Transcriber’s Note: The below is an extract syndicated news column that appeared in many newspapers on or about March 10, 1929. Getting a break in America is largely a matter of luck, according to Bela Lugosi, new Hungarian recruit in the film colony. Not all talking picture actors are propagandists for the audibles. 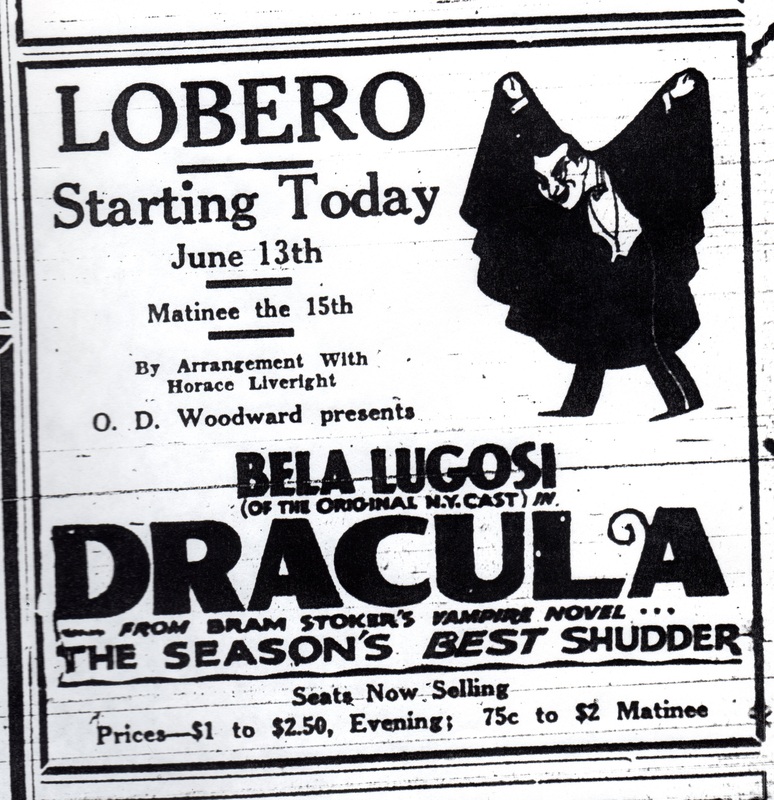 Bela Lugosi, eminent Hungarian star, playing in Dracula at the Columbia, sees no future for them, although he has done two within the last few months. A year ago, when the screen began to talk, the result was called a novelty. Lugosi still calls it that and holds out no hope for the speakies, even with their novelty worn off. The Hungarian star isn’t yet a true Hollywoodian, although he lives there. He has failed to go Hollywood in other ways then being pessimistic over the talkies. The talk switched to another phase of thespic training. 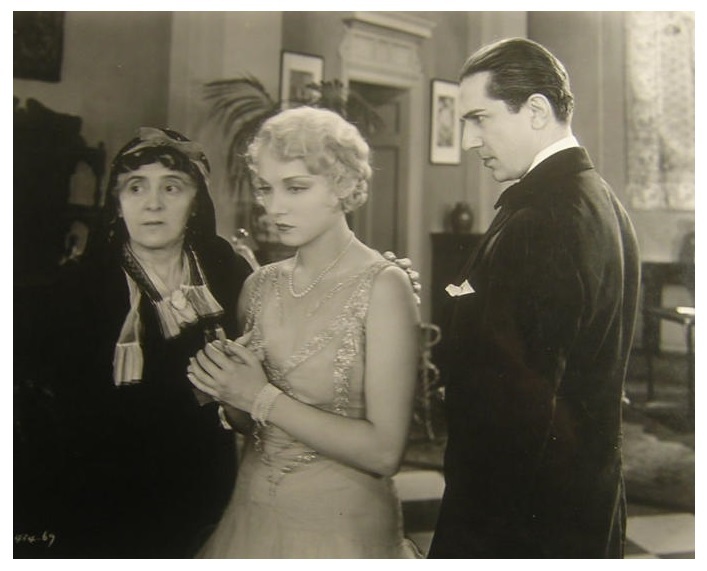 “Acting is a combination of many arts,” Lugosi remarked. “Dancing is another art which helps the actor to acquire ease and the grace of manner which is so essential upon the stage. Speech should be musical, and the more an actor knows about singing, the better will he be able to apply its principles to the speaking voice. Of course a knowledge of painting helps an actor in many ways, as proper color schemes for costumes and make-up are so essential in adding a touch of reality to his interpretation. It was already known that Lugosi’s home is one of the most artistic in Hollywood. Each piece of furniture is of different design, and these designs he drew himself. His home had added interest, for there he will later take his bride, the former Mrs. Beatrice Week, to whom he was quietly married in Redwood City today. She is the widow of the late Charles Peter Weeks of this city, a noted architect. Only one attempt has been made to broadcast Dracula, the shudder drama. Bela Lugosi reports that the drama was radioed in New York, and there was much indignation among the listeners. One woman, says Lugosi, telephoned in demanding that it be stopped because she had 6 children who had to listen to it. Transcriber’s Note: The below is an extract syndicated news column that appeared in many newspapers on or about July 26, 1929. Herewith nominated for the Hollywood Hall of Fame is Bela Lugosi. You know him better perhaps as “Dracula”—so fixedly has the Hungarian stage actor become associated with the gruesome vampire role. About two years ago a young fellow flew across lots of water through lots of air and landed on a field near Paris to be greeted by cheering thousands. “I am Charles Lindbergh,” he said. As if that were really news! Lugosi begins his lines in that pronounced foreign accent of his…Cold, cutting interrogation—Bela a detective in The Thirteenth Chair. He is quizzing Moon Carroll, fresh from the stage …the dialogue waxes warm…Then Browning waves his arms. For the third time the scene is spoiled. Someone has slipped on the lines. “Tis Moon,” accuses Tod, impersonally, patiently, inoffensively. Moon acknowledges guilt, prettily laughing. “But it was my fault!” insists Lugosi, unperturbed, suave, gallant. Talking pictures may have proved an insurmountable obstacle to some famous foreign actors, but they have not proved so to Bela Lugosi. Lugosi is a Hungarian who came to America several years ago, as one of Hungary’s best actors. Politics following the war found him an exile from his home country, and Lugosi landed in New York with not one word of English.. When Tod Browning,, who has spent several profitable years directing Lon Chaney’s pictures, was casting his mystery thriller, The Thirteenth Chair, he chose the Hungarian player to enact a Scotland Yard detective, who solves the mystery. For a talking picture, such a step was almost revolutionary, but Browning is elated over what he considers a discovery for the screen. 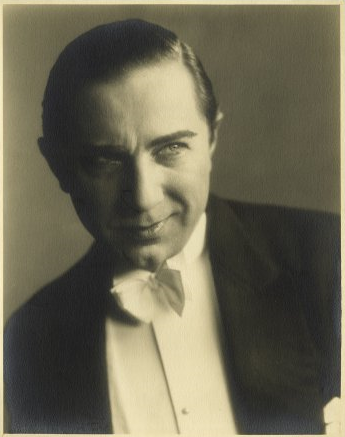 Lugosi is best known as the New York portrayer of the title role in Dracula. His first role, after two years of directing and producing plays in Hungarian in New York, was in The Red Poppy, and when he got the role he knew no English. He made a bargain with the producer of the play for the latter to grant him four months’ time and an English actor to coach him in his lines. By sheer memory, he went through the whole part. The opening night when he was receiving congratulations from his audience, he only bowed. He knew no English. By his next role in Arabesque, he was beginning to learn. He cannot understand why other foreign actors cannot become line perfect in a similar manner for the talkies. Lugosi believes that an intensive study of a role is necessary before an actor can give to the talking picture the best of his talent and training. “The screen will learn to draw on the vast fund of stage technique perfected through the centuries, and when it has learned this, talking pictures will become as great a medium as the stage,” says Lugosi. 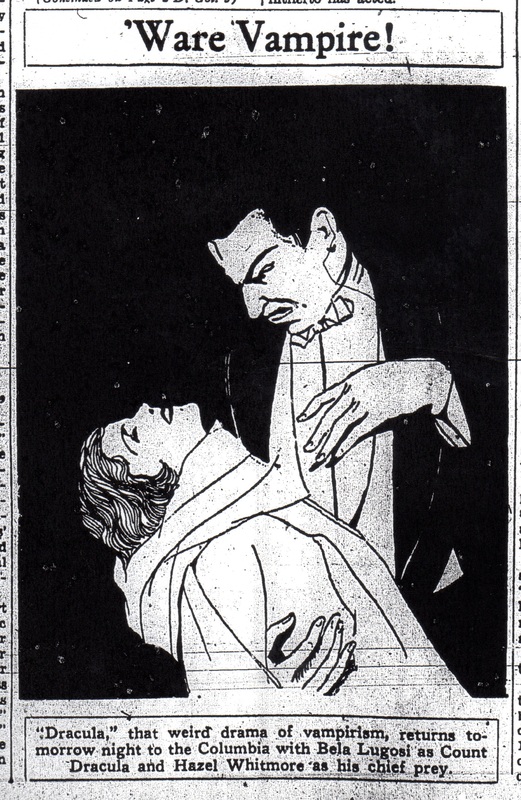 Bela Lugosi has the lead in the play “Dracula,” now at an Oakland theatre, but he will play no lead part in the divorce action now confronting him in Reno.